Whether you’re just hearing about Code Rush or have rallied up your A-team and solved 140 challenges, this is an announcement you won’t wanna miss. Over the past month, thousands of students, hundreds of teams and over 35 states participated in Code Rush, CodeMonkey’s national coding competition. This epic event all started with a warm-up that got students excitedly jumping into the jungle of code and working together to solve 140 challenges. Elementary and Middle Schools competed in their age division for the tight race. The top 10 teams from each division will receive a yearly CodeMonkey classroom subscription ($300 value), $115 worth of DK’s best selling coding books for children and an official trophy plaque from CodeMonkey! Curious to know who made it to the top 10? 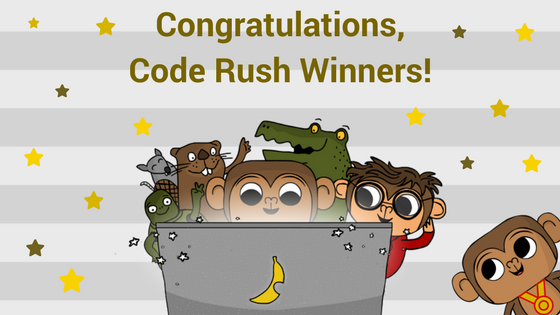 Thank you to all who participated, Code Rush wouldn’t have been such a success without you!! See you next year! Not in the U.S and interested in Code Rush? Contact us to find out if you can bring CodeMonkey to your area next year! Next PostNext Is Technology Influencing How Teachers Accept Change?